UPDATE: Global Youth Day is happening right now. Watch the live video. Adventist youth around the world plan to skip church on Saturday, March 15. Instead of listening to another sermon, these youth plan to actually be the sermon! It's called Global Youth Day (GYD) and the General Conference Youth Ministries wants youth to go out and share God's love to their communities through acts of kindness. Eight million young people participated in last year's Global Youth Day, according to the GC Youth Ministries Dept. It was also the Adventist Church's largest social media event. Four million people were talking about it on the Internet, according to Adventist News Network. The youth department created an official app for iOS and Android. The app lets you take pictures and upload photos of you sharing Jesus. 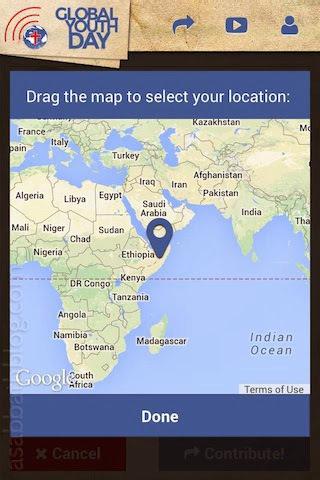 Users can add captions and location to their photos. 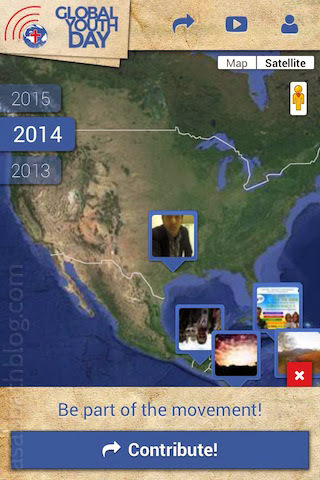 Photos are added to a map with all the photos of users around the world. To upload photos, you must sign in with either your Facebook, Google, or Twitter account. So be careful before you let your friend use your phone to post something from their account, because you might not be able to use it to log into your own account. You can also upload pictures from the official GYD website. The website was much faster than the app and we were able to log in and out our accounts just fine. The website was available in English, Spanish, Portuguese, French, German, and Russian.